Just saying the word Italy conjures up images of pasta, wine, gondolas, and the sun shining on gorgeous landscapes. It was the home of the Roman empire and the Renaissance. It’s a country packed with so much history, art, delicious food, and romance, it’s no wonder it’s one of the most popular vacation spots in the world. 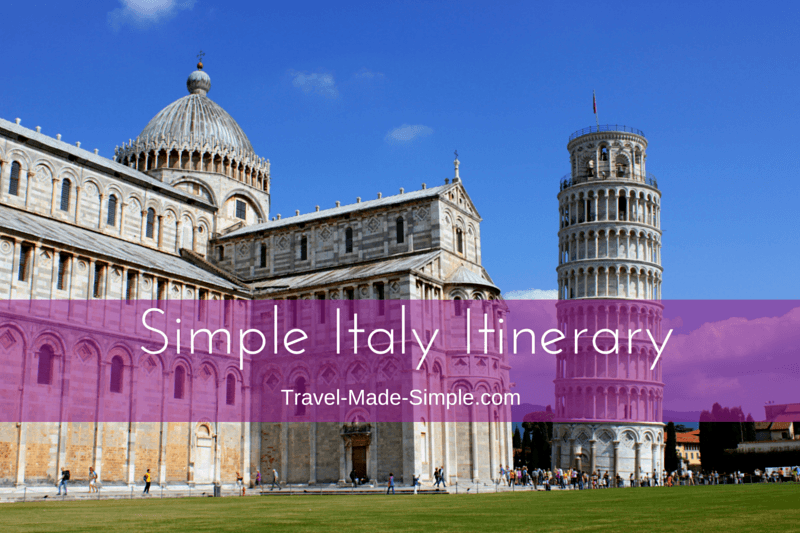 I’ve gathered information about some of the highlights of the country to help you start planning your Italy itinerary. 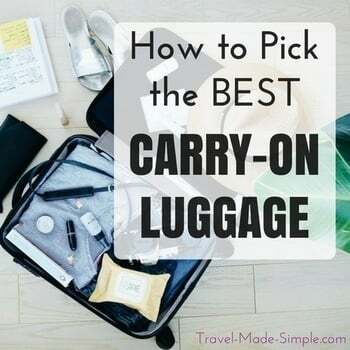 As always, don’t try to do all of this in one trip, especially if you only have a week in Italy or even two! Remember that Italy is roughly twice the size of the state of Florida, so you can’t see the whole country on one vacation. Your best approach is to pick a few cities and spend a few days in each. Another good option is to pick one or two regions and explore the big cities as well as the smaller ones. It takes time to get from one city to the next, so leave room for travel time in your schedule. Here are some ideas for the best Italy itinerary. Rome is not a city to rush through. It was once the most important city in the world, and you could explore for months without seeing everything. Roman ruins are in every nook and cranny, grand piazzas and fountains are around every corner, and outdoor cafes all around the city just beg for you to sit for a few hours and soak in the ambiance. Search for a hotel in Rome here. 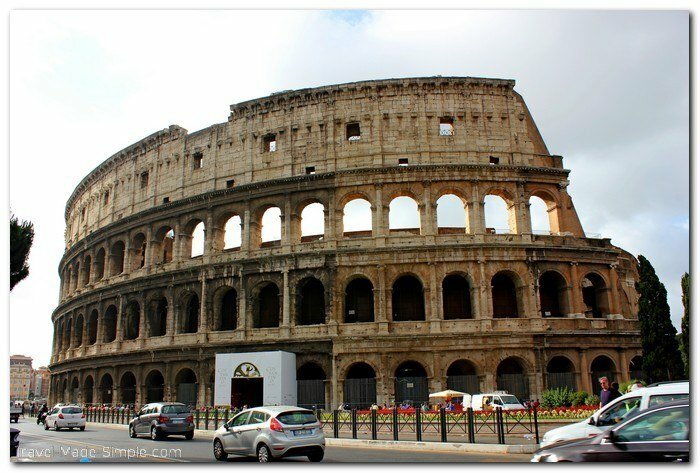 The Colosseum – The Colosseum is one of the most recognizable attractions in the world, and it’s even more amazing in person. Admire the intricate architecture and learn about the gory history of the gladiators. I took this tour and really enjoyed the exclusive access to the underground areas and the third tier for an amazing view. Plus it was great being away from the crowds and skipping the line. The Roman Forum – Next to the Colosseum, this was the center of public life. Politics, religion, and commerce all converged here. Today archeologists uncover more layers of history and ruins here all the time. Often the Roman Forum is included on Colosseum tours, and that was true with the one I took. Pantheon – This is one of Rome’s most fascinating buildings due to its impressive dome. It was the largest dome in the world until the 15th century, and it is still the largest non-reinforced concrete dome ever built. Spanish Steps – Named for the nearby Spanish Embassy, this grand set of stairs is a place to sit and people-watch while resting your feet from all the sightseeing you’ve been doing all day. Piazza Navona – This large piazza contains three extravagant fountains and several cafes. Campo de Fiori – An important and historical market, here you can find fruits and vegetables, as well as oil, vinegar, lemoncello, and many other typical Italian foods. Castel Sant’Angelo – Originally built as a mausoleum for emperor Hadrian, this was later converted into a papal palace. A secret passageway from the Vatican was built in the 13th century. Vatican City – The smallest sovereign state in the world lies entirely within the city limits of Rome. This is the home of the Catholic Church and the extensive Vatican museums. And don’t forget its biggest attraction, the Sistine Chapel. Some tours, like this one that I took, will even get you early access to see this famous ceiling. Nothing compares to seeing it without the shoulder-to-shoulder crowds. 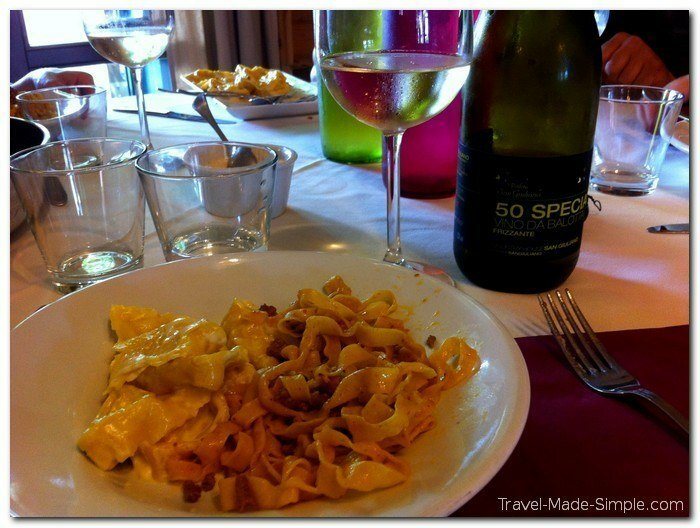 Food tours – Rome has loads of fun and entertaining food tours. They’ll let you taste a variety of different foods, and some will even show you how to make pizza or pasta. I took this one and this one (I’ve been to Rome several times and I can’t resist food tours!) and I enjoyed them both. They’re completely different experiences, but you can’t go wrong with one of those food tours. You can read a full review and comparison of these two Rome food tours here. This isn’t even everything to do in Rome! There are plenty of museums and other attractions throughout the city. Don’t try to squeeze it all in. Sights like the Colosseum, Roman Forum, and Vatican City will take several hours each. Decide which ones are important to you, throw that coin into the Trevi Fountain, and see more of this wonderful city on your next visit. Florence was the center of the Renaissance period, and today it’s still a city filled with art. It’s also a good base for a longer trip around Tuscany that could include Pisa, Siena, Cortuna, and the Chianti area. Read reviews for Florence hotels here. Uffizi Gallery – One of the top museums in the world, the Uffizi Gallery is not to be missed. Allow plenty of time to explore roughly 50 rooms of art from a wide variety of time periods. Galleria dell’Accademia – Though there are plenty of paintings to see here, this museum’s main draw is Michelangelo’s David. Reserve your ticket in advance to avoid waiting in line for hours. Piazza del Duomo – The Duomo is one of the most iconic landmarks in Florence and in Italy. The colors and details of the cathedral’s facade are sure to impress. 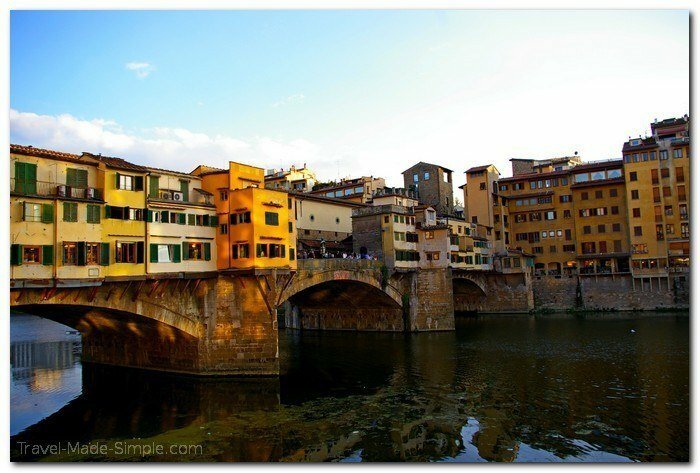 Ponte Vecchio – This famous bridge was built in 1345. It was the only one saved from destruction during World War II. Piazza Michelangelo – Here you can find one of the city’s two David copies as well as a panoramic view of the Florence. This often-overlooked city is an easy stop to add to your Italy itinerary between Florence and Venice, especially since the train stops there. It’s also one of the best places to experience food in Italy and often referred to as Italy’s culinary capital. 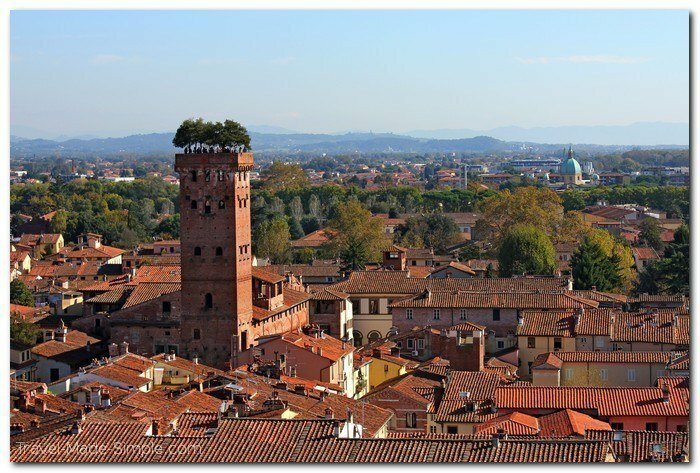 Bologna makes a good base if you’re interested in a longer trip around the Emilia Romagna region, including Parma, Modena, Ferrara, Rimini, and the micro country of San Marino. Find a great hotel in Bologna here. Piazza Maggiore and Piazza Nettuno – These adjacent piazzas are in the center of Bologna. Piazza Maggiore is the larger of the two and is located in front of Basilica di San Petronio, the fifth largest basilica in the world. Piazza Nettuno is named for the Fontana del Nettuno (Fountain of Neptune) that dominates the square. Basilica di San Petronio – This basilica was originally planned to be built larger than St. Peter’s in Vatican City, but during construction Pope Pius IV blocked it by commissioning a university on the eastern side. The Basilica was never fully completed. The Quadrilatero – This district is full of bustling market stalls, delis, cafes and other restaurants. This is a good place to start exploring Bologna’s food culture. Le Due Torri – These two tall, leaning towers rise above Piazza di Porta Ravegnana in the University Quarter. The taller of the two, the 97.6 meter-high Torre degli Asinelli, is open to the public, and for a small fee you can climb the 498 steps to the top. Cooking classes – Bologna is the perfect place to sign up for a cooking class due to its culinary traditions. You can find anything from a half day experience to a full week course. 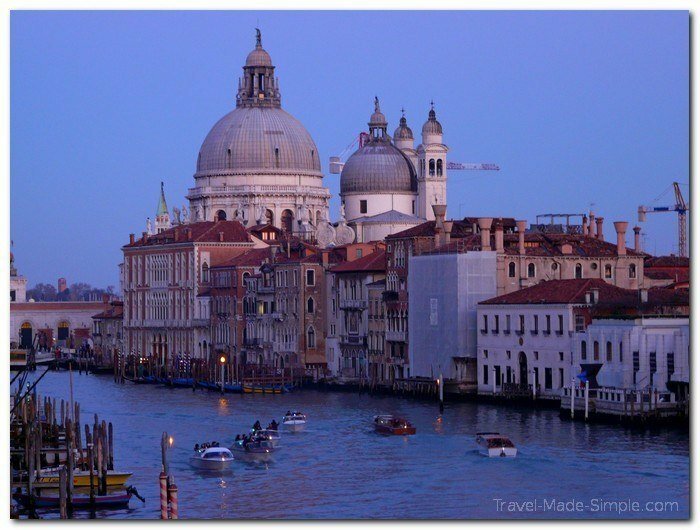 Venice attracts many visitors with its abundance of canals and romantic gondola rides. The city is a must for most people’s Italy itineraries. For a longer trip in the Veneto region, consider visiting Verona, Vicenza, or the Dolomites. Search for the perfect place to stay in Venice. Grand Canal – Since the canals are the big draw, start with the biggest of them all. The Grand Canal is the main canal that runs through the city. Consider taking a gondola ride to complete your Venice experience. Rialto Bridge – One of the most famous bridges in Venice, this spot makes for some great pictures of the Grand Canal. Piazza San Marco – This is the main square in Venice where you’ll find people feeding pigeons and trying to get the birds to perch on their outstretched arms. Basilica San Marco – The square got its name from this basilica, and it is a spectacular church. You can do a quick walk through the church for free, but it’s a lot to take in during the allotted 10-15 minutes. Reserve your spot ahead of time, and expect to pay a fee on holidays and special occasions. Some sections of the basilica are only accessible by paying an entrance fee. The arts – Venice has long been a city of art. This is a great place to take in an opera or explore more than a dozen museums. Cinque Terre is a cluster of five tiny villages that hugs the coast and wows visitors with its impressive terraced cliffs. There are also a few other villages in the area that are worth visiting even though they technically aren’t part of Cinque Terre. 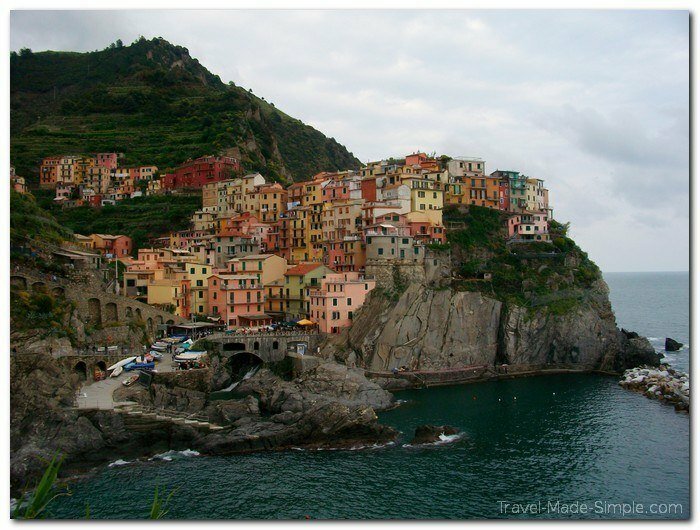 Check out hotels in Cinque Terre here. Explore the Cinque Terre villages – The five villages are (from west to east) Monterosso, Vernazza, Corniglia, Manarola, and Riomaggiore. Cars are not allowed in the villages, helping to preserve the feeling that this area hasn’t changed in centuries. You can take local trains from one village to the next or hike the trails that connect them. Nearby towns – La Spezia, Porto Venere, Rapallo, Santa Margherita, and Portofino are some of the towns and villages near Cinque Terre. They vary in size, beauty, and price. You can explore these towns as day trips from Cinque Terre, or base yourself in one of them and see Cinque Terre on a day trip or two. The Amalfi Coast stretches west from Salerno along the southern side of the Sorrentine Peninsula, south of Naples. It is famed for its gorgeous cliff-clinging towns and seaside views. Look for a hotel with a view along the Amalfi Coast. 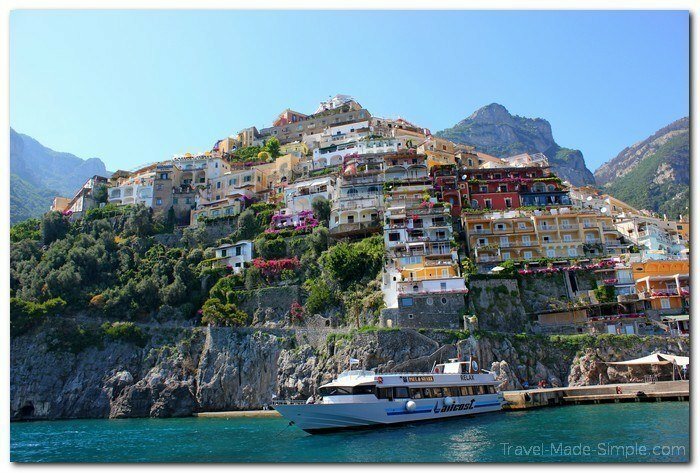 Positano – This is the most famous town on the Amalfi Coast, and also one of the most expensive. Positano is located towards the western edge of the coast. Amalfi – The town the coast is named for is roughly half way between Salerno and Positano. Centuries ago, this was the seat of the Maritime Republic of Amalfi. Other villages – You don’t have to stay in one of the more popular towns. Other villages, such as Praiano, Ravello, or Maiori, also offer the stunning views the Amalfi Coast is known for, and they’re usually much less expensive. Take day trips to Amalfi and Positano. Side trips – The Amalfi Coast is a great place for boat trips to nearby islands, such as Capri and Ischia. Or hop on a ferry between Amalfi and Positano to enjoy views of the coast from the sea. You can also take a day trip up to Pompeii if you don’t want to stay in Naples, though it will be a long day. Transportation Note: The Amalfi Coast is a beautifully rugged place, but the beauty comes at the cost of not having a train route. Trains go to either Sorrento or Salerno. From either of these towns there is a public bus route that winds across the peninsula and myriad of private options if you book ahead. The landscape of Tuscany is what a lot of people think of when they envision Italy. Florence is often the gateway to the region, but Siena or Pisa can make a decent base as well. Tuscany is mostly small towns spread across rolling hills, so you can take day trips to see different sections. If you are interested in driving in Italy (which can be daunting), you can see more in this region. Even still there is plenty to see from the trains. Siena – A hilltop city known for its enormous central square where they hold a yearly horse race. There is a tower and a church to climb. Pisa – One of Italy’s most famous sites is the leaning tower in Pisa. The tower (and all of the souvenir hawkers) is in the Field of Miracles. Beyond that you will find a pretty river and a couple of lively streets of a university town to walk through. Lucca – Once every city was ringed in walls, now only a few remain. Lucca is one of these. It is a cozy town with plenty of tourist infrastructure. Cortona – Made famous by the movie “Under the Tuscan Sun”, Cortona is one of a row of hill towns just off the main train route between Florence and Rome. A small town perched on the side of the hill, it does retain its charm despite the famous movie. Check out this trip on gAdventures. Stay in southern Tuscany and get to know the cooking and culture first hand among locals and far from the bustling hordes. Sicily is the large island in southern Italy that the mainland “boot” is kicking. This is the setting of the Godfather movies and is a different Italy than the North, with different food and still active volcanoes. There are trains, but they are slower than on the mainland, so if you want to do a lot of exploring you may need more time than you might expect. For example Palermo to Siracusa will take you at least 5 hours on the train, and Messina to Palermo is 3 hours. Palermo – The capital city of the island perches on north western coast. Day trips to nearby islands or the medieval twon of Cefalu are common. Siracusa – A charming town in the south-east that still shows its Greek roots. Temples, one converted to a Catholic cathedral, a castle, and marble line streets makes a nice place just to relax. Taormina – A beautiful main square, ancient Greek theater, nearby beaches, and a castle looking over it from high on top a nearby hill, Taormina offers experiences for every interest. Mt Etna – A still active volcano sits near Taormina and Catania. Catania – A larger city on the south east that is often a base for exploring. Agrigento – Hilltop town in southwest Sicily, home of the UNESCO listed Valley of Temples. Stromboli – An active volcano in the sea among the Aeolian Islands chain north of Sicily. Most people flying to Italy will look for flights in and out of Rome. This is useful if you are starting or ending your time there. Fiumicino Airport is about 30 minutes by train from the main station (Termini) in Rome, so be sure to give yourself plenty of time, especially on the way out if you have an international flight. Milan airport (Malpensa) has several international routes and is also an hour outside of town. Venice, Savona (near Genoa in the north), Rome (in the form of Civitavecchia) and Naples are common cruise stops in the Mediterranean. Bari and Brindisi on the Adriatic side have some ferry routes to Croatia and to Greece. There are also ferries from the west coast to destinations like France, Spain and Tunisia. The best way to get around in Italy is by using the train. Almost every town has a train station and major towns are connected by the high speed Frecciarosa and Frecciablanca train services of Tren Italia. Of our suggested list, only Amalfi Coast is not reachable by train. For more information check out our entire post on riding the rails in Italy. Book trains in Italy and all over Europe using Omio (formerly GoEuro). It’s straightforward and all in English, and it can even show you bus and flight options. If you do only have a week in Italy, you need to pare it down. The country is bigger than it looks and is packed with things to see and food to eat. Do yourself a favor, travel slowly and enjoy your time here. It’s what the Italians would do. Ppick a few places above and add up the days, remembering to allow for travel days between each destination and enough time to get to your flight out at the end. Only a week in Italy? 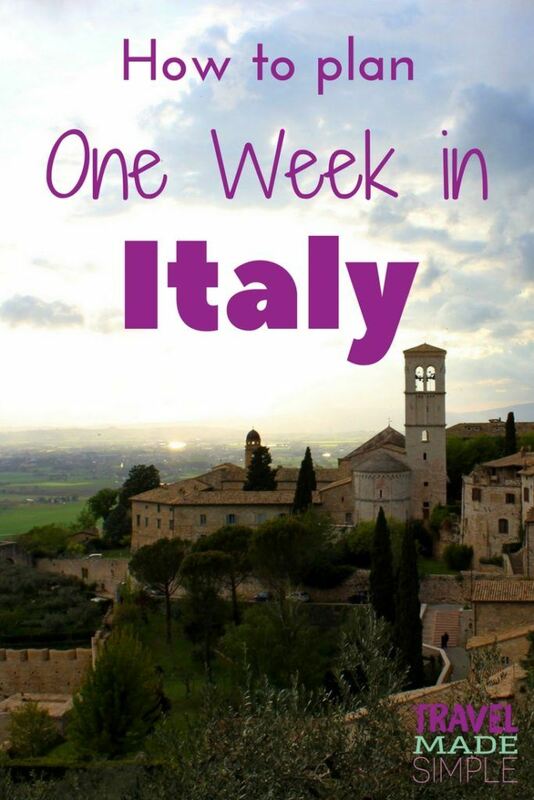 Here are four ideas of how to combine the building blocks above into a one week Italy trip. Two cities and a few day trips is about all you will have time for with only 7 days in Italy, especially with arrival and departure days probably being short. More than that and you will end up more on the train than seeing things. 4 Days in Rome, 3 Days in Florence: Leave Rome late on the fourth day so you have three full days in Tuscany. Then do a day trip out from Florence, for example to Lucca for its city walls or Pisa for its tower. 4 Days in Rome, 3 Days in Venice: Again leave Rome on the fourth day to give yourself plenty of time in Venice to see Murano in the lagoon. Fast trains from Rome to Venice stop in both Florence and Bologna, so you can get a taste of either of those along the way if you want a longer day. 3 Days in Rome, 4 Days in the Amalfi Coast/Capri: Head from Rome early on the fourth day. It isn’t as fun arriving in the Amalfi Coast in the dark. Pick either Sorrento or one of the smaller towns as your base. Don’t forget that Pompeii is nearby. 4 Days in Siracusa, 3 Days in Taormina: If you want a completely different view of Italy with a much more relaxed vibe, head to these two towns on Sicily. They still retain some of their Greek roots and are overlooked by volcanoes. Do you have two weeks in Italy? 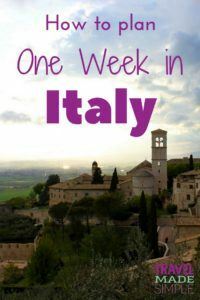 This is a quick two week Italy itinerary to hit up both Rome and Venice with a glimpse of Tuscany and Bologna along the way. 14 days in Italy gives you a little more flexibility than a week. This is still a pretty fast trip, but gives a broader look at the country. This is just a sample. You could be add days or change out places however you feel. No interest in Venice? Swap it out for Cinque Terre, for example. 4 days – Start in and around Rome. Explore the museums in the historic center, take a food tour, explore calmer Trastevere and just soak up the Eternal City. 3 days – Head north to Florence. Use the city as a base to explore the city itself, with a day trip to Siena in the heart of Tuscany and another day to see the famous tower in Pisa (if you are so inclined). 2 days – Take the train to Bologna. Walk the markets of this university city and hunt your favorite Apertivo place. 4 days – Finally head to Venice to get lost in the canals. Check out Murano and Burano nearby. 1 day – Take the train back to Rome and spend your last night if you have an early morning flight out. Alternatively see if Milan has a flight that might be better. 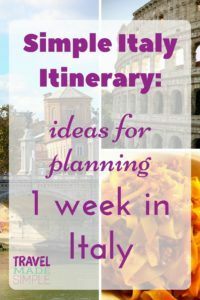 Hopefully our Italy itinerary and ideas for planning one week in Italy and 2 weeks in Italy have been helpful. The following posts provide more in-depth information about Italy travel, tours in Italy, and specific cities and regions. And if you’re looking for a little inspiration, be sure to check out the books and movies recommended below. Rome Food Tour Review: Make Your Own Pizza! Eat Pray Love: the book or the movie. Both were really great, but the book is, of course, a more in-depth account of the author’s journey through Italy, India, and Indonesia. Under the Tuscan Sun: This is the movie version. It’s loosely based on a book, but it’s one of the few books I’ve ever been unable to finish. However, the movie is fantastic. La Dolce Vita: The classic Federico Fellini movie set in Italy is a must. This is a very clever thing to do! This certainly looks like a super cool itinerary if someone wishes to visit Italy in a limited time. 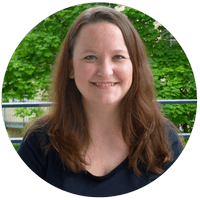 Thanks Agata! It’s a lot for one trip, but broken into a few different pieces, this gives people a great introduction to Italy.